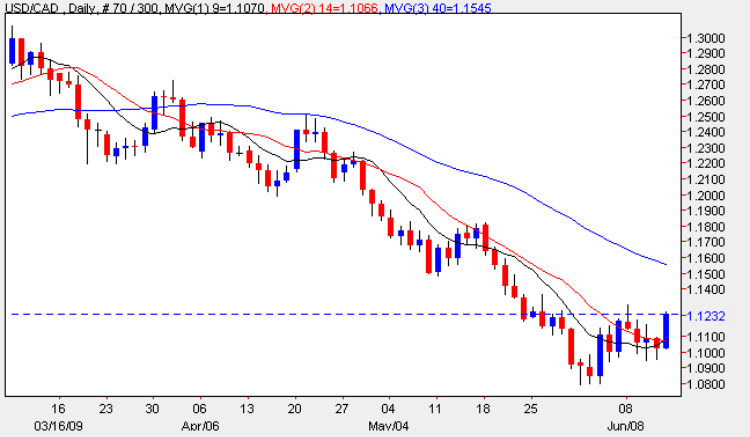 The dollar to cad continued to consolidate yesterday ending the day on a narrow spread up bar with a small lower wick which found some support in the 1.0950 region which aligned closely with the previous lows of the last few days, and closing marginally below the 9 day moving average. It is interesting to note that these two averages are now converging and indeed about to cross, suggesting that we may see a short squeeze in this pair once again, a pattern which has emerged in early trading today. Whether this will convert into a longer term reversal or is simply as a result of some dollar strength temporarily returning to the market, only time will tell. With constant negative sentiment emanating from the US administration and, in particular, from Fed Members such as Dennis Lockhart, a sustained rally in the US dollar is extremely unlikely until this anti dollar rhetoric ceases. With the G8 and G20 meetings now in progress in Italy and Germany respectively, and with the weekend ahead, now is not the time to be trading on such an uncertain and volatile day. My suggestion is therefore to wait until early next week before entering the market which, by then, will have had a chance to absorb any news from these meetings.